Price charts for dividend stocks don’t tell the whole story. 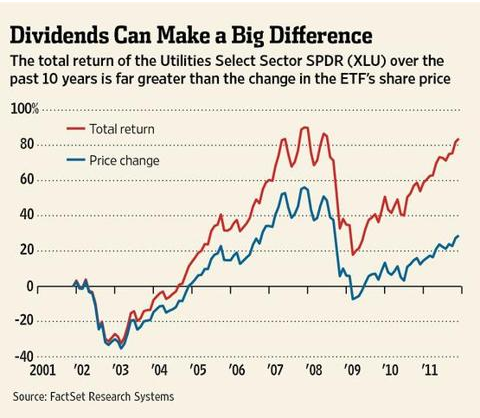 Over long periods, such as 10 years, the contribution to total return from dividends can be quite substantial, as shown in this chart of price return and total return for the S&P 500 utilities sectors ETF (XLU). This entry was posted on Friday, April 27th, 2012 at 6:21 AM and is filed under Interesting Charts. You can follow any responses to this entry through the RSS 2.0 feed. Both comments and pings are currently closed.